Search engine submission is the most practical part of SEO following Website Audit, SEO analysis and SEO advice implementation. This is why SEO has long been associated primarily with the search engine submission services offered by SEO companies. 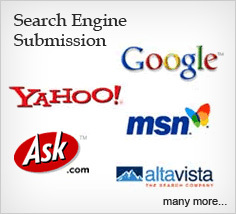 Submission had been considered a must do, but it was a time-consuming and boring task until search engine submission software was invented. The main reason behind website submission to search engines and directories is links rather than traffic generating. The major search engines have a chance to pick up your site if they find links to it on other sites or if you have submitted a Sitemap. But directories, unlike Google, won't include your site unless you submit information. The same applies to most local search projects that will discover your site only if you submit its pages to those search engines. Search engine submission is how a webmaster submits a website directly to a search engine. While Search Engine Submission is often seen as a way to promote a web site, it generally is not necessary because the major search engines like Google, Yahoo, and Bing use crawlers, bots, and spiders that eventually would find most web sites on the Internet all by themselves. There are two basic reasons to submit a web site or web page to a search engine. The first reason would be to add an entirely new web site because the site operators would rather not wait for a search engine to discover them. The second reason is to have a web page or web site updated in the respective search engine.